Students from the Higher Education and Training courses in Nature Conservation all returned from their workplaces to start their second semester modules on 23 July 2018. This, after they have spent three months back at their workplaces completing the practical component of their studies called Work Integrated Learning (WIL). During WIL students are expected to complete assignments specific to their workplaces but also related to each module that they cover in their studies throughout the year. For example, if they learned how to do a plant press during their Vegetation Studies module, they then need to collect plant specimens back at their workplaces and make their own plant presses. The assignments that need to be completed during WIL contribute significantly towards the students’ final year mark. To check up on the students’ progress with WIL, management personnel from the Natural Resource Management department visit a sample of students from both the Higher and Advanced Certificate courses at their workplaces each year. This year all students from Eastern Cape Parks and Tourism were visited at six different reserves scattered throughout the province as well as a student in the south of Lesotho and all students based in the Kruger National Park. These visits highlighted the challenges some students face because of being based at remote posts where even basic resources such as electricity, transport and mobile network connections are limited or non-existent. The College is currently working on potential solutions to bridge these limitations and for organizations to ensure that students are provided with sufficient resources and time to complete their assignments during the WIL period. 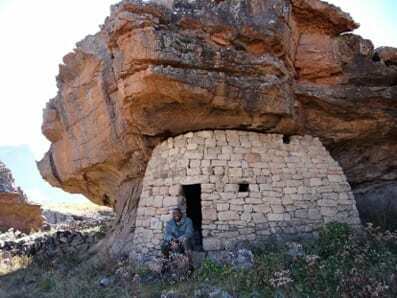 Sefali Lesaoana from the Higher Certificate Class at a famous cultural heritage site in Sehlabathebe National Park (Lesotho) where he is employed as a field ranger.